If you’ve been to an upscale fishmonger lately, you may have seen them selling “dry” scallops. While you probably wouldn’t want to order a dry pork chop or a dry slice of cake, in the case of scallops, “dry” in the label is a good thing. Most sea scallops are treated with phosphates to help preserve them, but these chemicals also make the scallops absorb water. This is good for the people selling scallops, but it’s bad for you because you’re essentially paying for the extra water the scallops have absorbed. Aside from tasting watery, treated scallops also have a mushy texture, and leave a weird aftertaste. 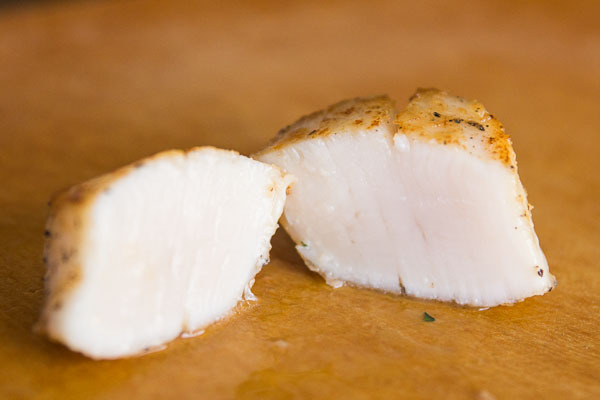 When scallops are labeled as “dry” it means that they have not been chemically treated. The meat tends to be firmer with a delicate sweetness and savory flavor that sets off umami receptors on your tongue like lights in a pinball machine. Of course the lower yield and shorter shelf-life means they’re going to cost more per pound, but if you consider the better taste, along with the fact that you’re not paying for bloat, they’re definitely worth the premium. 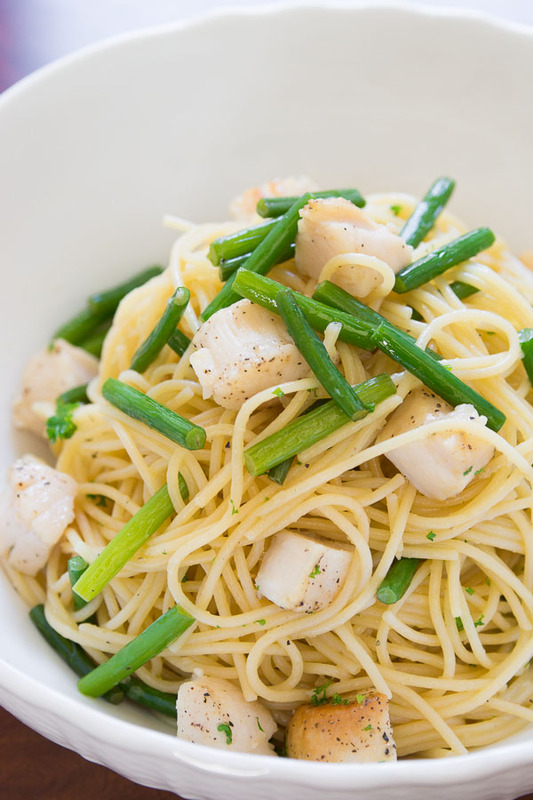 The sweet crunchy garlic scapes are both a perfect compliment and contrast to the sweet tender scallops. With each strand of pasta coated with nutty Parmigiano Reggiano, and a lacquer of browned garlic flavored olive oil, it’s hard to believe that this simple spring pasta only takes about 10 minutes to make. 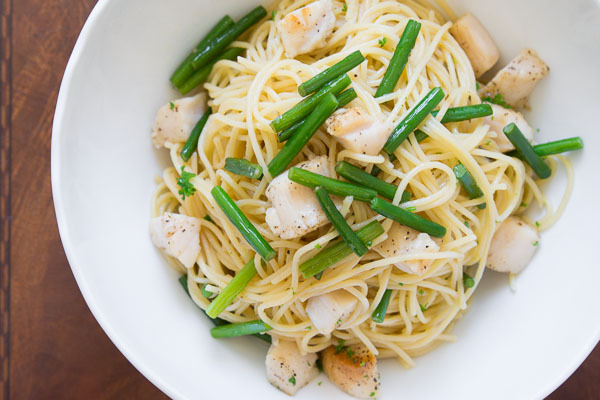 Just make sure you have all the measuring and prep done before you start, so that the scallops and pasta are done around the same time. 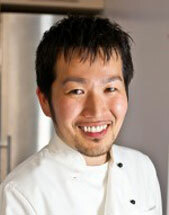 Food blogger Marc Matsumoto explains dry scallops in a full post on the Fresh Tastes blog. Use paper towels to remove as much moisture from the surface of the scallops as you can. Bring a large pot of heavily salted water to a boil then add the pasta. I like my pasta very al dente, so if the package says 9 minutes I usually only boil it for 8. Start heating a large sauté pan over medium high heat. Generously salt and pepper the scallops on both sides, and then dust each side of the scallops in the flour (try not to get any flour onto the sides of the scallops). By now, your pan should be hot. Add the olive oil and then add the scallops. Fry on one side until they turn opaque about a third of the way up the sides. Flip them over and fry until they’re opaque about a third of the way up the second side (the middle third should still be translucent). Transfer the scallops to a cutting board, and then add the garlic to the pan. 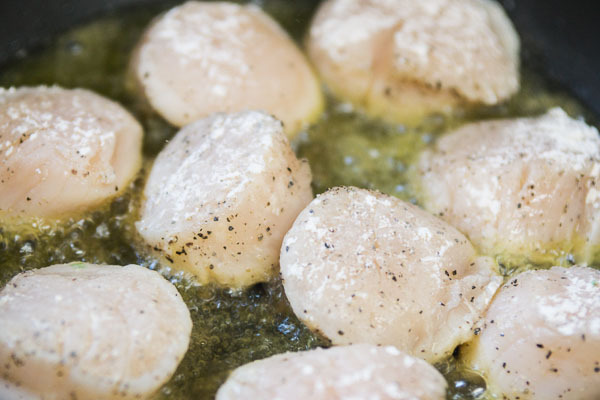 While the garlic is browning, slice the scallops into quarters. When the garlic has browned around the edges, add the garlic scapes and stir-fry. Your pasta should be just about done, so when the timer goes off, drain it and add it in with the garlic. Return the scallops to the pan along with the Parmigiano Reggiano and toss everything together using tongs.